Midfielder Jo Potter praised the calming half-time influence of manager Rick Passmoor as Notts County came from a goal down to beat Sunderland 2-1 at Meadow Lane. Sunderland’s Victoria Williams’ hooked the ball home just before the break to give the visitors the lead but the Lady Pies came out strongly in the second half. Headers from Rachel Williams and Jess Clarke earned Notts County three valuable points which sees them leapfrog Sunderland and Reading in the FA Women’s Super League 1 table. And Potter said the wise words of Passmoor at the interval helped the team turn their performance around. “It wasn’t the greatest first-half from the girls today and we needed to come out and prove a point in the second-half and turn it around,” she said. “All credit to us and the manager, who didn’t lose his head at half-time, which he could of on that first-half performance, and he showed his experience there giving us guidance and a talking too. “It can be devastating when you get hit with a sucker goal just before half-time and you haven’t got time to comeback and fight against it. “So we went into half-time a little bit low but the gaffer brought us back up to scratch and said the game is not over yet, and we certainly proved that. Sunderland’s manager Carlton Fairweather was left disappointed by the manner with which his side let Notts County back into the game after a strong first-half performance. But he was confident his side would learn the lessons of their defeat ahead of their next FA WSL fixture. “It was a disappointing result in the end, giving away two soft goals, both set pieces, it wasn’t a game where they carved us open and scored a great goal,” he said. “That’s what is so disappointing about the result; it’s just making sure in our two remaining games that we take some points. “The message at the start of the second-half was to expect the unexpected. 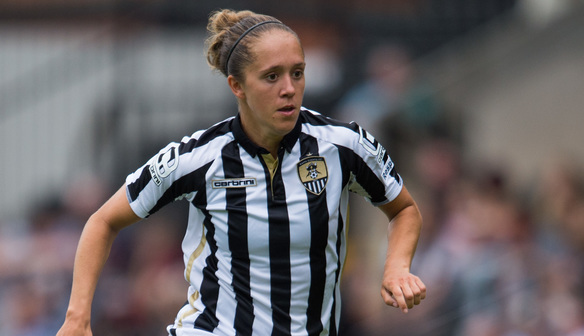 Notts County (4-4-2): Megan Walsh; Aivi Luik, Fern Whelan, Laura Bassett, Danielle Buet; Jo Potter, Jade Moore, Leanne Crichton, Angharad James; Jess Clarke, Rachel Williams. Substitutes Not Used: Elizabeta Ejupi. Sunderland (4-4-2): Rachael Laws; Abby Holmes, Victoria Williams, Stephanie Bannon, Keira Ramshaw; Kelly McDougall, Hayley Sharp, Madeline Hill, Lucy Staniforth; Beth Mead, Abbey Joice. Substitutes Used: Beverly Leon for Joice 74, Emma Kelly for McDougall 74.